Is it still cheaper to cook from scratch? Is it still cheaper to cook from scratch? I mean, really? I’ve worried about this a bit recently. A month or two ago I spent longer than usual in my local supermarket having a good look around. There are certain aisles that I never go down because a) I don’t buy ready meal type stuff and b) you can’t be tempted by what you aren’t looking at! However, I thought I’d have a look to see what was available and I was amazed at some of the prices on things like pies and pizzas. They were so cheap and would be so filling that, regardless of how junky they might be, you can totally see why someone really hard-up would fill their trolley with them. Looking at some of the things available, I knew that I wouldn’t be able to make them myself for any cheaper – it would actually be more expensive. I found this pretty depressing. However, I think that this is far from true in most cases. It does depend on how much time you are willing to put in overall to save what just seems like a few pence here and there. I was talking to someone the other day about soup. Both of us have soup for lunch most days. Mine is home-made while hers is tinned. I worked out that my substantial bowl of lentil and tomato soup had cost 14p whereas her tin of soup cost 89p – a 75p difference. My soup was very healthy and had no preservatives apart from anything you might find in a stock cube whereas I know from experience that tinned soup is very, very salty by comparison and has a long list of ingredients that I wouldn’t even be able to pronounce. If I reckon on having soup for lunch 5 days a week, 52 weeks a year then I save £195 annually by making my own soup. My friend could argue that she doesn’t have the bother of making and storing the soup which would be right. Her main point is that 89p is still a very cheap way to have lunch. This is true – particularly when you think that you could easily spend £2.50-£3 on one of those ‘meal deals’ that include sandwiches, crisps or a chocolate bar and a drink. It is also healthier, even though it is processed. And those meal deals are cheaper than going ‘out’ for lunch. And so on and so on. It is all a matter of choice and how far you are willing to cut back before you aren’t comfortable. My 14p soup is about as cheap as I can get! However, we are far from ‘perfect’. Making our own bread would be cheaper but that wouldn’t work for us. We don’t eat bread quickly enough for it not to go stale and I wouldn’t want to give up freezer space to bits and bobs of bread (on a large scale anyway). That’s why I wouldn’t dream of criticising my friend for buying tinned soup instead of making her own – she is probably more economical than me in something else she does. Making soup is easy for me because it fits in with the way I do things and the way I eat. Making my own bread doesn’t. That said, perhaps I should put a bit more thought into what else I could save on by making from scratch! I go through spates of being contacted by companies about this blog. I was asked to participate in a Channel 4 documentary, I’ve been approached by a couple of national magazines and newspapers and I’ve lost track of the number of companies who want to link up or have me write reviews. For one reason or another I’ve always said no. Then Sainsbury’s asked if I’d like to review their Jaffa Cakes and Cumberland Sausages and I thought, why not? I’ve been going through an ‘I heart Sainsbury’s’ phase anyway (since reading up about their policies and perusing the ‘Live well for less’ section of their website for recipes and ideas) so the idea of a review seemed particularly well timed. 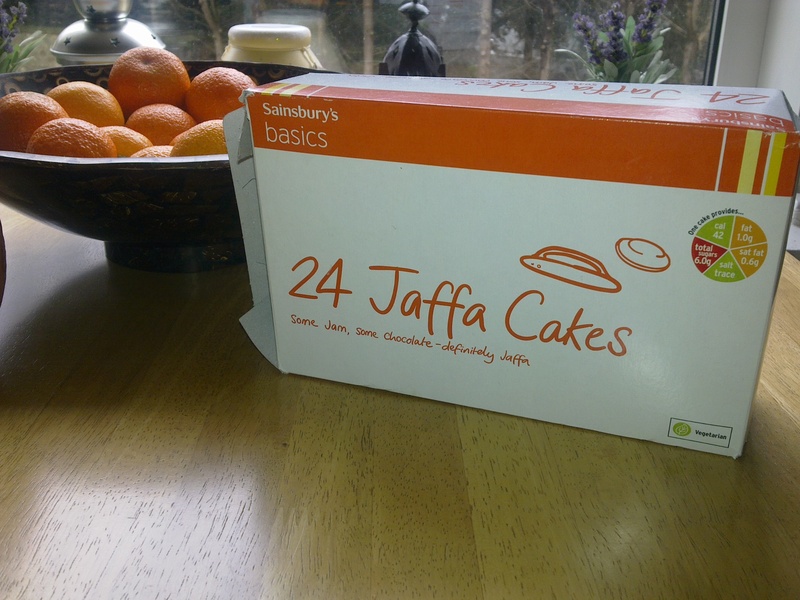 The own-brand jaffa cakes were gorgeous – really good. I’ve tried own-brand jaffa cakes from another supermarket in the past and they were really dry and biscuity and not at all like the real thing. Husband and I were really impressed with these – particularly considering that they are from the ‘basics’ range (Sainsbury’s do a ‘posher’ version than those that we tried so I suppose they are better still). We’d be more than happy with these any day though and at 72p for a box of 24 I’d say they are a bargain! We also tried out the Sainsbury’s Butcher’s Choice Cumberland Pork Sausages 454g which, again, we were really impressed by. In the past I’ve used two other supermarkets when I’ve bought similar packets of 8 sausages and these beat them hands down on quality, taste and texture. My nearest Sainsbury’s is quite a drive so I don’t go that often but I am genuinely impressed by the quality of the food (and by the info on the website I’ve already mentioned) so I’ll definitely be considering getting my shopping by home delivery (only £3 on a Wednesday evening in my neck of the woods). And on that note I’m off for a cuppa! Husband spending a night in A&E after having a nasty fall and breaking his elbow and fracturing his arm – ow! Waiting to see if they are going to operate or not. Reading like a maniac. Mainly Philippa Gregory. I am currently reading and loving Bill Bryson’s ‘At Home’ (from the library). More on this when I’m further in. Booking a cheeky holiday. I know. Unplanned spending – naughty but nice! Found a great deal on a weekend in a tiny (but beautifully presented and equipped) cottage and we are off in a couple of weeks to celebrate our 13th wedding anniversary (lucky for some 😉 ). Finishing the Christmas shopping. Just about. I need to get some photos printed, buy some chocolates and parcel up the stuff that needs to be posted long distance but other than that I am done! Hopefully I’ll be back to regular posting soon, probably once Husband is getting some treatment one way or another and I’m back into the swing of things at work. Happy weekending everyone! I’ve got some time off coming up and I have to say I cannot wait. It was only about 6 weeks ago that I had a week off and we went away for a few days. However, those were an exhausting few days (for a long list of reasons) and in some respects I don’t really feel like I’ve caught up since! I’ve managed to make some adjustments to my diet and whatnot. I’m not there yet but I’m getting towards being on the right track. Friday will be the first day of 10 consecutive days off – Yay! Husband will still be working (Mum and Dad – the child care team 🙂 – are going away) so it will just be me and Baby. I am really looking forward to having a big chunk of low-key time with her. Incidentally, I must stop referring to her as ‘Baby’ here because she is really a toddler now and not a baby but I don’t know what else to call her! Anyway, I’m thinking about using my time off and the break from the usual routine to give a bit of focused attention to the diet/food/exercise issue. It might just be thing I need to get me going in a more healthy direction!